2019-2020 IPhO National Student Leadership Application Opens Soon! We are pleased to announce that the 2019-2020 IPhO National Student Leadership application will open on February 18, 2019! Because of the rapid growth of the organization, we have added new National Student Officer (NSO) positions as well as new regions for our Regional Student Officers (RSOs) for the coming year. This is a great opportunity for students to lead national initiatives, expand their networks, and make a difference in a professional organization on a national level. Check back again on February 18. Position details, eligibility requirements, and application instructions will be available. Good luck! Industry Pharmacists Organization (IPhO) and Center for Communication Compliance (CCC) have partnered to launch a Regulatory Compliance Certificate Program customized for students pursuing an industry career, as well as graduated pharmacists looking to break into industry. The program equips PharmDs with critical knowledge about foundational government and industry requirements that impact the roles and responsibilities of industry pharmacists. “Compliance is a top priority for the pharmaceutical industry and the regulatory environment is very complex. 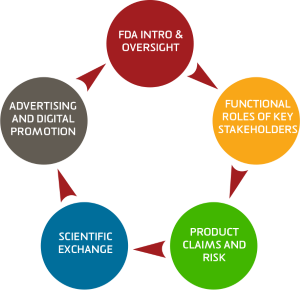 This program covers key regulatory principles related to advertising and promotion and explains how these principles apply to the various types of product communications typically seen when working in industry,” comments IPhO consultant Leah Palmer, PharmD who was formerly Executive Director of Regulatory Promotion at Amgen. The custom eLearning program features ten distinct modules on compliant promotional activities and scientific exchange, followed by a post-test that participants must pass to earn their certificate of achievement. Participants can also engage in interactive online games that help reinforce the regulations, guidances, and codes discussed in the coursework. Program content is reviewed for accuracy by former government officials and regulatory lawyers and updated based on material changes in regulatory policy. “We are delighted to prepare future industry pharmacists to communicate scientifically balanced, medically accurate information that contributes to the development, commercialization, promotion, and optimal use of medicines,” states Ilyssa Levins, CCC President. James Alexander, PharmD, IPhO Executive Director and Founder, adds that "this comprehensive certificate program is another example of how our organization is providing timely, relevant information to our members to help them advance their professional careers." This article was originally published on barbarapachtersblog.com. It’s that time of year again – the time to make New Year’s resolutions. But instead of just going the traditional route – pledging to join a gym to work off holiday excesses – why not opt to give your career a boost as well? Resolve to improve your communication skills. Washington State University College of Pharmacy and Pharmaceutical Sciences Joins IPhO National Network! IPhO is pleased to announce the addition of another new student chapter to our growing national network! Congratulations to student pharmacists at Washington State University College of Pharmacy and Pharmaceutical Sciences. IPhO now connects them to a national network of 63 chapters and 4,000 student pharmacists with similar interests, as well as a national network of hundreds of industry fellows and thousands of industry pharmacists. Several more schools are in the late stages of filing their chapter applications and will soon join the growing national network. To start a chapter at your school, click here. For the student benefits of joining IPhO, view the National Student Brochure here! Even though Midyear is behind you, there is still work to do! Some of you may already be embarking on your onsite interviews. Others may be searching for new fellowship opportunities. Wherever you are, check out the list of post-Midyear tips below to make sure you continue on as strongly and confidently as possible. Best of luck! Be sure to send thank you cards and/or emails to all team members who interviewed you onsite. Being so far into the process, these thank yous will help keep you fresh in the minds of those you met. Never stop networking! Continue to reach out to fellows/industry professionals to learn more about how to get your foot in the door, whether it be through applying for contract positions or other fellowship opportunities that arise post-midyear. Concordia University Wisconsin School of Pharmacy Joins IPhO National Network! Congratulations to student pharmacists at Concordia University Wisconsin School of Pharmacy. 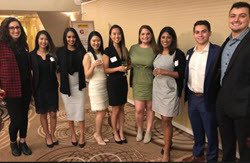 IPhO now connects them to a national network of 62 chapters and 4,000 student pharmacists with similar interests, as well as a national network of hundreds of industry fellows and thousands of industry pharmacists. As a pharmacy student in pursuit of a post-doctoral fellowship in the pharmaceutical industry, you are probably feeling like attending ASHP Midyear and interviewing well was the be-all and end-all of furthering your career. However, not all P4 students hoping to land an industry position have the opportunity to fly out to the conference and only a small amount who do attend actually land positions during midyear. The bad news? Competition is fierce and it only gets more brutal every year. The good news? I am here to tell you that ASHP Midyear is not the only way to get your foot in industry’s door so that you can begin your fellowship the summer after graduation. There are other opportunities waiting for you just around the corner, but you must be prepared to take advantage of every single one that comes your way in order to establish yourself professionally. Last year, I returned home from the happiest place on earth (Orlando, ASHP Midyear 2017) having secured a few on-sites, but was devastated to learn that I did not actually secure a fellowship position. I had been hoping for a fellowship since my P1 year and it felt like all my chances to do what I really wanted in my career were eliminated. My hopes were shattered and I had no idea what to do next. It felt surreal and it took a lot of motivation and courage not to give up right then and there. To kick off the 2018 Midyear Meeting in Anaheim, IPhO and its National Fellows Council hosted an exciting event for all fellows from across the country to network and learn the ins and outs of how to land a full-time position post fellowship. Moderated by IPhO Executive Director Jim Alexander, the program featured a series of roundtable discussions with successful fellowship alumni/industry executives who shared their insights and guidance on how to pursue a full-time position within industry. South College School of Pharmacy Joins IPhO National Network! Congratulations to student pharmacists at South College School of Pharmacy. IPhO now connects them to a national network of over 4,000 student pharmacists with similar interests, as well as a national network of hundreds of industry fellows and thousands of industry pharmacists. 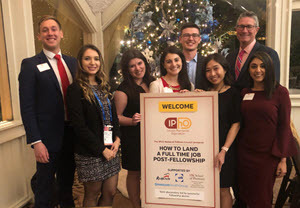 The University of Connecticut School of Pharmacy has added the IPhO Value of Industry Pharmacists (VIP) Case Competition as a 1 credit Independent Study Research Course option, beginning spring 2019. The VIP Case Competition provides student pharmacists with the unique opportunity to demonstrate their pharmaceutical industry knowledge and design a comprehensive drug development plan. Students are involved from the hypothetical drug’s initial concept, all the way through to approval and product marketing. Click here to learn more about this year’s competition. University of Connecticut School of Pharmacy students interested in learning more and obtaining permission to participate for credit can email Dr. Andrew Wiemer.